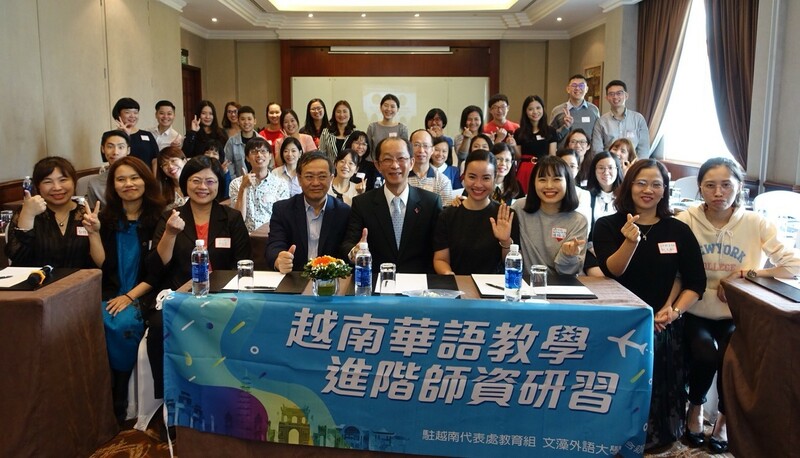 The Taipei Economic and Cultural Office in Vietnam held the Advanced Teacher Training Camp for Mandarin Chinese Teachers in Vietnam on December 1 last year, and then the 2018 Conference for Mandarin Chinese Teachers from North of Hue on the following day, December 2. At the Advanced Teacher Training Camp for Mandarin Chinese Teachers in Vietnam on the first day, Professor Lin Tsui-Yun from the Department of Applied Chinese at Wenzao Ursuline University of Languages gave a presentation on Combining Real and E-learning Methods for Learning Mandarin Chinese, and Cheng Ya-Wen gave a presentation on Curriculum and Teaching Design for Mandarin Chinese Courses: Reading and Writing. More than 70 chairs of Chinese departments and professors from universities in Vietnam participated. Significantly, Nguyen Tien Hong, secretary-general of Vietnam’s VCCI Taiwan Affairs Office and Nguyen Thi Thu Ha, a senior officer from Vietnam’s Ministry of Education and Training arranged time to attend the opening ceremony. Twenty teachers from Taiwan who are helping to teach Chinese in universities in Vietnam and in Laos participated in the Conference for Mandarin Chinese Teachers from North of Hue on the second day, during which the Education Division of TECO in Vietnam gave a presentation on the Responsibilities and the Mission of Vietnamese Teachers of Mandarin Chinese, and Dr. Nguyen Hoang Anh from VNU University of Foreign Languages gave a presentation on the Importance of Cross-cultural Knowledge for Chinese Language Teaching in Vietnam. All the presentations received enthusiastic responses from the Mandarin Chinese teachers and inspired lively discussion. Photo:Participants in the Advanced Teacher Training Camp for Mandarin Chinese Teachers in Vietnam on December 1, with Nguyen Tien Hong, secretary-general of Vietnam’s VCCI Taiwan Affairs Office (front row, 4th left), and Lee Ming, director of the Education Division of the Taipei Economic and Cultural Office in Vietnam (on his left).